“A SUFFOLK church was packed yesterday as a large crowd gathered to witness a mysterious spectacle which appears to honour the spring equinox. Visitors at Barsham Church, near Beccles, watched in awe as a beam of evening sunlight filtered through a small window, and bathed a sculpture of Christ on the Cross in a golden light. The phenomenon was only recently rediscovered by a vicar after being hidden for centuries because the sculpture, also known as the rood, was taken down. The Rev John Buchanan discovered it in the early 1990s, but has only recently been able to make sense of it after recording its occurrence over a number of years. It may date back as far as the 1300s when the window was built. He predicted that the entire rood would be directly lit yesterday shortly after 5pm and within minutes the figures were bathed in gold. The figures may also be partially lit today , depending on conditions, and the phenomenon is repeated at the autumn equinox in September. Rev Buchanan said: “The rood figure of Christ on the Cross was taken down in about 1550 and was not put back until 1870. In 1875 a large picture covered the little window and it wasn’t until after a fire in 1979 that we took the picture down. “It was only after that, providing that conditions were exactly right, that there was a chance of seeing it. Then it was a case of realising what we had seen and trying to remember to check the dates for the next year. 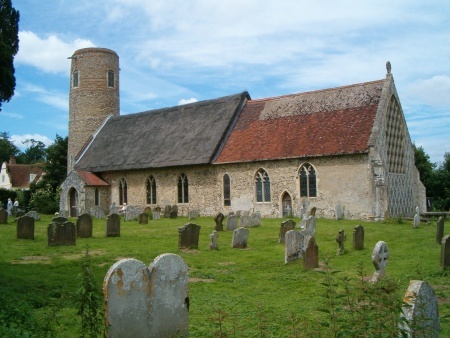 Rev Buchanan said that as far as he is aware this phenomenon was unique to Barsham Church. The purpose of the spectacle is not clear, but Rev Buchanan suggested that without a compass the easiest way for stone masons to align a building was to use the sun. He also thinks that it may have an agricultural purpose to mark the time between winter and summer.